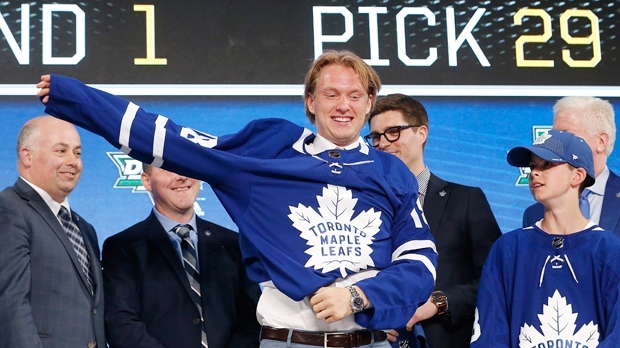 DALLAS -- The Toronto Maple Leafs traded down in the 2018 NHL draft before selecting Rasmus Sandin with the 29th pick on Friday night. The 18-year-old left-handed defenceman from Uppsala, Sweden produced 12 goals and 45 points in 51 regular-season games with the Ontario Hockey League's Sault Ste. Marie Greyhounds in 2017-18. Sandin, who says he models his style of play after Chicago Blackhawks blueliner Duncan Keith, was ranked No. 11 amongst North American skaters by the NHL's Central Scouting Bureau heading into the draft after being 16th at the midpoint of the season. The five-foot-11, 186-pounder got a brief taste of pro hockey in his home country, playing five games with Rogue of the Swedish Hockey League before joining the Greyhounds. The Leafs entered the draft with the 25th pick but general manager Kyle Dubas swapped it with the St. Louis Blues for the 29th and 76th pick moments before it was Toronto's turn to make its original selection. St. Louis used the 25th pick to select German winger Dominik Bokk, who spent the 2017-18 season playing for the Vaxjo Lakers of the Swedish Hockey League.